The 2012 Sailabration attracted tall ships from across the U.S.
Baltimore tourism officials said they think September’s Star-Spangled Spectacular festival, the culminating event for the War of 1812 Bicentennial celebrations, will top 2012’s Sailabration in both visitation and economic impact. 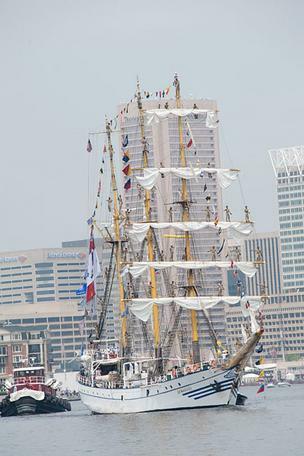 Sailabration drew 1.5 million visitors to Baltimore in June of 2012 and left a $166 million economic impact on the city. At a press conference to kick off the 2014 bicentennial events, Mayor Stephanie Rawlings-Blake challenged Visit Baltimore CEO Tom Noonan to make this year’s 10-day festival even bigger. Noonan said he thinks Star-Spangled Spectacular will be at least that big, but he wants to see more people come throughout the summer rather than just for the 10-day festival Sept. 6-16. “There wasn’t a room to be had, it was hard to get a restaurant reservation, we were near capacity, and that’s what we’re looking for again,” Noonan said. Events throughout the summer will lead up to the festival, starting with reuniting the original manuscript of the “Star-Spangled Banner” with the original 15-star, 15-stripe flag at the Smithsonian National Museum of American History on June 14, Flag Day. The Chesapeake Campaign will also continue from June through August at historic sites throughout Maryland. Like Sailabration, Star-Spangled Spectacular will include tall ship tours, air shows by the U.S. Navy Blue Angels and fireworks displays.